I have been looking for photos of Monks in Thailand doing some work, this is for the video of my new single I shall be bringing out, I made a nice catchy tune, still got a few lines of music that sound a bit awkward, such as, "rotting fish sandwich" the sandwich isn't very Thai, also Thailand isn't really known as the "land of plenty", still got plenty of time to work on it, think it will do well in the charts. So lets get back to the saffron robed ones doing some work, yep you see a monk working get the photo and post it here, looking back through my galleries I have loads of Thai monks in photos, very few are actually doing any work though. First up is Mr Brickie Monk, this was taken some where around Pattaya, one of the small villages on the outskirts. Same Temple, here the main Monk, Abbot keeps them working, he has some molds he uses to make the elephant things, assume they sell them and use the profits for the Temple, good profit in those sort of things, molds can be filled everyday, costings of cement and sand and a tiny bit of steel rebar is around 40 baht, sale price in the shop after a bit of paint, well choose your price. Now this is a real building project, not sure how good with a trowel this Monk is and he may not have the skill level needed for this job, but the worse that could happen is he completely messes up something that is hundreds of years old due to his lack of skill, well, it's old already anyway. Does food gathering count as working? At his age I wouldn't be climbing that massive tree for a bit of food, suppose the work aspect is debatable, but I would consider it working, and dangerous. 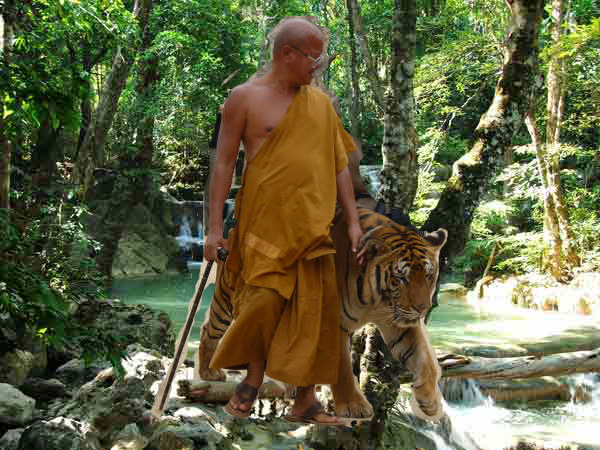 We all know this Monk from Kanchanaburi, the man of the Tiger Zoo fame, is being a tiger walker a job? Maybe Tiger trainer? Regardless another job I would turn down. I have never trained or walked tigers and i have never been killed or attacked by one and want to keep it that way also. They do a good job wandering around neighborhoods collecting freebies,i don't think thats a proper job either. 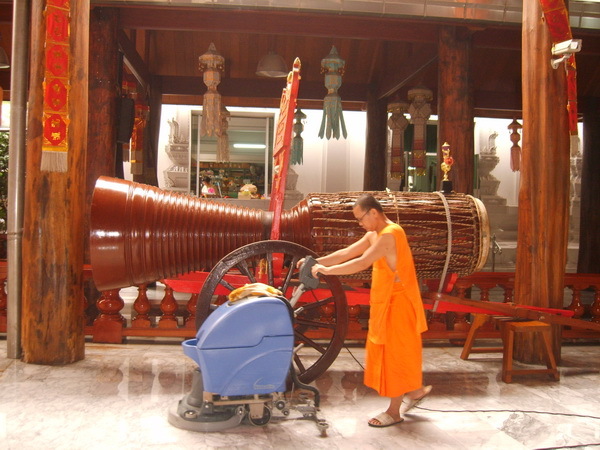 A monk at Wat Paknam polishing up the granite floor. Note the drum behind him, that's a big bugger.